NEP will be the first to deploy Canon’s new 4K UHD-DIGISUPER 111 broadcast lens during a live broadcast in the U.S., using it this Sunday at the AFC Championship in Kansas City, Mo. Announced along with the UHD-DIGISUPER 122 at IBC 2018, the UHD-DIGISUPER 111 features a 111X zoom, delivering a whopping 925mm on the telephoto end (1,850mm with the built-in 2X extender) and an 8.3mm wide setting. 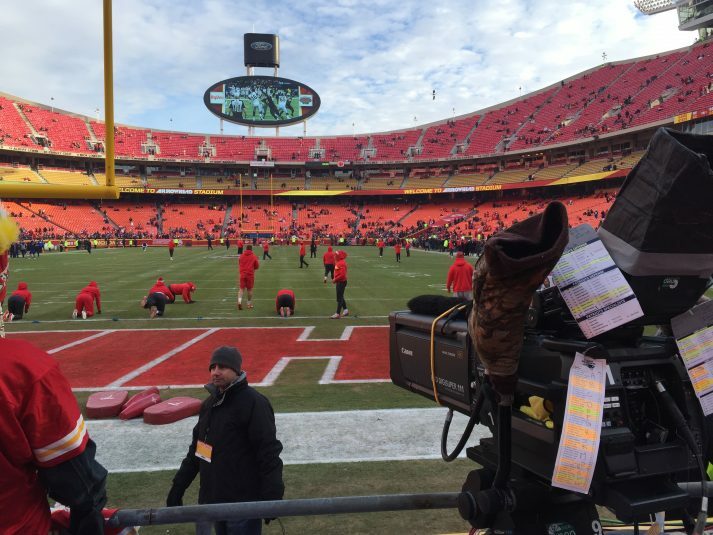 Canon’s new 4K UHD-DIGISUPER 111 broadcast lens makes its debut at the AFC Championship Game in Kansas City. In addition to the new 111X lens, NEP will deploy Canon’s new 122X lens, among others, for coverage of the game at Arrowhead Stadium. Both lenses have the ability to exceed 4K resolution, providing high-quality color reproduction from wide end to telephoto end. Canon’s flagship 4K field zoom broadcast lens, the UHD-DIGISUPER 122, features the world’s widest angle and world’s longest focal length — 8.2mm at the wide end and 1,000mm at the telephoto end — and the world’s highest zoom ratio: 122X. The UHD-DIGISUPER 111 features a 111X zoom ratio and a focal-length range of 8.3mm to 925mm. Both new lenses deliver the ability to record high-resolution and high-contrast video from the center to peripheral areas of the imaging field. Additionally, both lenses are the first Canon 4K field zoom lenses with Canon’s proprietary Air Sphere Coating (ASC), which reduces flaring and ghosting compared with previous lens coatings. ASC coating enhances both the high dynamic range (HDR) and wide color gamut (WCG) of the lenses, providing more-natural and more-vivid tonality, which is increasingly in demand for broadcast productions. Both lenses adopt Canon’s proprietary shift-type optical image-stabilization mechanism that achieves a high-suppression rate in wide frequency bands and leads to smooth images. Very little image fluctuation is seen even during high-frequency vibrations.